Mans Best Friend ! | Gods Love & Stories Of The Past? Why is it so hard for us to under stand Gods love and how much it would improve our relationships ? This is a picture where a boy and his hound is on the same page and it starts with Gods love in the little guy and his heart and he shares it with his hound ? But at the same time his hound connects with his little masters heart ! Look at the expression on his hounds face ? God created dog to be a companion with man and the love and respect they have for one another is definitly in Gods plans for us ! The joy that is created between man and dog can certainly be created between man and his brethern in everyday life if everyone made a little effort to try to find the only ” free thing ” that is left in this world and that is Gods free Grace ? [ KC you just got to find little KC a hound ? ] Blessings to all and have a blessed Sunday ! Ron. You can see her here if you like. KC and Corry I had to post this because to me its got Gods love all over it ? Blessings. Ron. Oh Ron…This is SO nice…I will have to come back tomorrow and look at is some more as it is after 3 in the morning and I better get to bed..
Great picture, Ron. I love it. I enjoyed your thoughts as well. That’s a great picture, Bro. Ron. Do you reckon that dog knows what he’s doing? Bro. Gordon, anything is possible but I would rather believe that he is wishing for a bigger bone ? Blessings. Ron. I have used that pic before on my blog. We must think a little bit alike, huh? Uh oh! 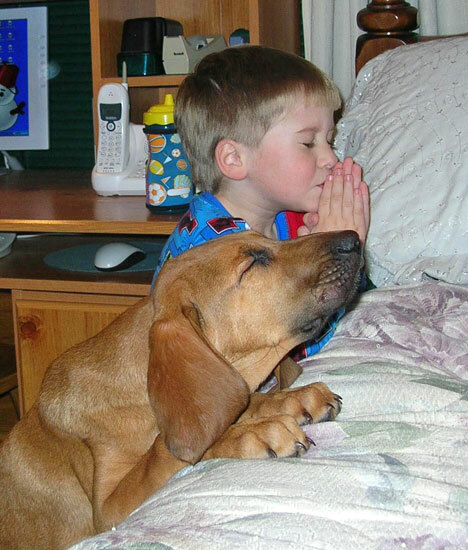 Great post…but do you think that hound has a better handle on prayer than we sometimes do??? Bro. Tony I would say that we both are full of brotherly love as commanded by our Master ! You know I’ve often thought about animals reactions ? Brett Biscuit is a one of a kind and it is amazing to see her say blessing ! Blessings Daddy . I love that photo. Thanks for stopping by my blog. I’m here with Ella, and she is wnderful. Dear Ron…Can you see why I love my blogging friends so much? So many have dropped into my blog and said that they will be praying for my dad and I am so grateful for that. It has really touched my heart and I want to thank you Ron..
How loviing of the Lord to save your dad in the little time that he had left! Thanks for dropping by Terry, and I know that the Lord blesses those who are faithful! Blessings . Ron. Hello Beverly glad you can enjoy Ella and don’t waste one minute of your time with her ? Blessings. Ron. Ha! Dumb me! I fiinally noticed on your last posting that you were driving a THREE wheeler Ron! I haven’t been much on the copmputer today because I have been kind of house cleaning. It is a a disater every time I decide to do that though because, I get looking at old pictures and just waste a whole lot of time going through them. I uncovered a bunch of our hoiday pictures, [when Bernie and I went out west via motor-cycle. I will have to make a blog post of them. I am a few postings behind but maybe I will have time tomorrow. Right now I want to put Susan Walker’s new kitty on a quick posting. Terry since I fired myself from doing my housework I have more time for computer and being outside where I’d rather be ? Yes I’m driving a three wheeler and I had to borrow my neighbors wife so I could go downtown and do shopping ? Blessings. Ron.